Teeming with temples, forts and countless other fascinating attractions, India is a destination that evokes images of the vibrant, spiritual and exotic. Rich with history and culture, there are plenty of amazing landmarks just waiting to be discovered across this intriguing country. If you’re considering a trip to the world’s second most populous country, be sure to learn more about these 10 incredible places to visit in India before you book! 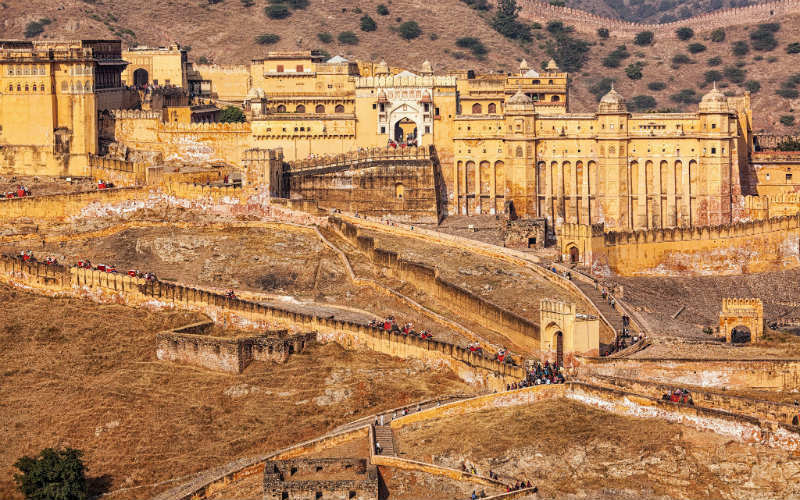 Situated just outside Jaipur, Amer Fort, also known as the Amber Palace, is a spectacular World Heritage listed site that attracts large numbers of visitors each year. Construction of the fort began in the late 16th century under Maharaja Man Singh, with subsequent rulers each building their own additions to the site. Blending ornate Rajput and Mughal design styles, the vast complex, made from red sandstone and marble, is home to some awe-inspiring interiors adorned with everything from intricate carvings through to thousands of tiny mirrors. Set within lush gardens, the ornate World Heritage listed Taj Mahal is one of India’s best known sights. Commissioned by Mughal emperor Shah Jahan in the 17th century, the beautiful marble structure was created as a mausoleum for his favourite wife, Mumtaz Mahal, who passed away while giving birth to the couple’s 14th child. Attracting upwards of 7 million visitors each year, the building and its marble domes and minarets are considered to be one of the world’s finest examples of architecture originating from the prime of the Mughal Empire. Constructed from sandstone and marble in the late 12th century, the Qutub Minar is considered to be the tallest brick minaret in the world, extending 73 metres into the air above. Positioned next to the Quwwat-ul-Islam Mosque, the tower is generally thought to have been commissioned by Qutb Ud-Din-Aibak to signify the start of Muslim rule in the region, although this notion has created some debate among scholars. 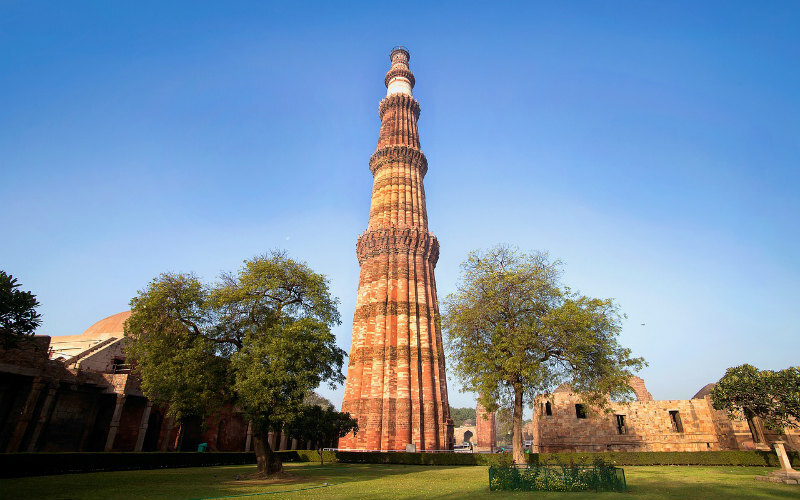 Decorated with Koranic engravings and ornamental motifs, the impressive five-tiered tower is located just a short drive from central New Delhi. One of the few forts in Rajasthan to not be built on a hilltop, Junagarh Fort is a grand fort complex comprised of palaces, temples and courtyards that were built over time to house the Maharanas of Rajasthan (the region’s ruling family). Currently preserved as a museum showcasing the extravagant lifestyle of the region’s ruling family, the fort is a great place to visit to gain an understanding of how India’s upper classes lived in days gone by. The interior of the well maintained fort is incredibly ornate, with carvings, inlaid semi-precious stones and paintings adorning its walls. 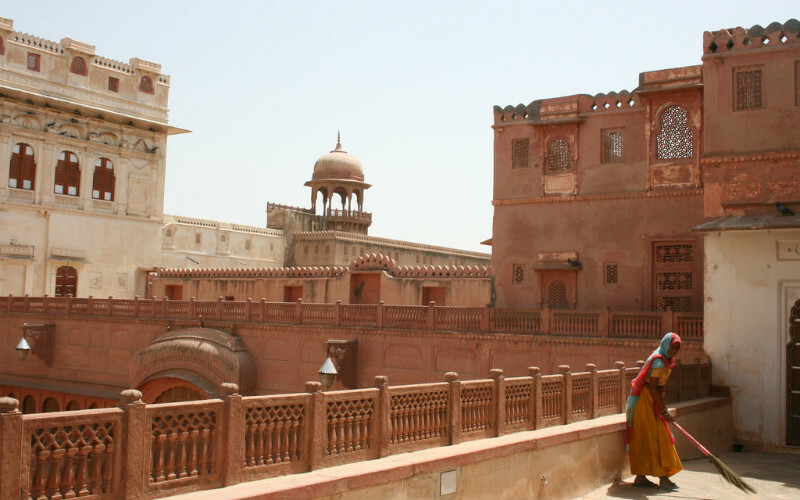 Junagarh Fort, India. Image Credit: celblau / CC by ND 2.0. Also known as the ‘Palace of the Breeze’, Hawa Mahal is one of Jaipur’s most recognisable landmarks. Standing at five storeys tall, the fascinating structure was built to allow royal women to view festivals and events on the street below, while remaining out of the public eye. 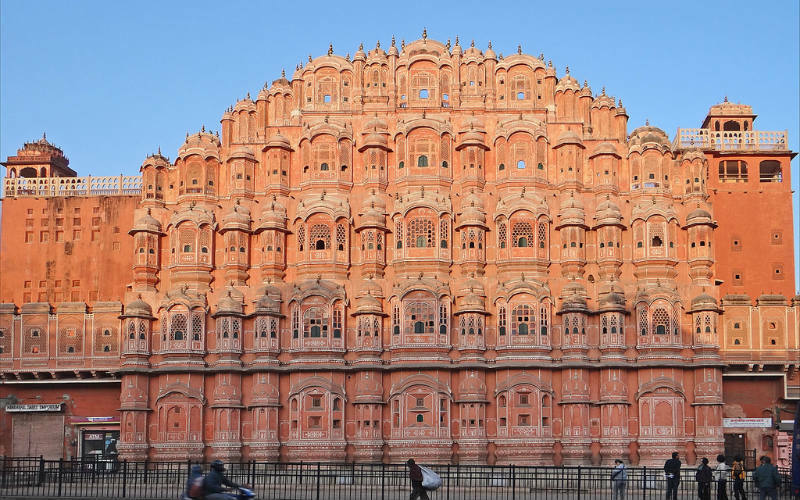 Made from red and pink sandstones, the Hawa Mahal features 953 windows that allow a light breeze to pass into the palace and help to give the structure its distinctive shape, which was inspired by the crown of Lord Krishna (a major deity within the Hindu faith). Hawal Mahal, India. Image Credit: Jean-Pierre Dalbéra / CC by 2.0. Amer Fort, India. 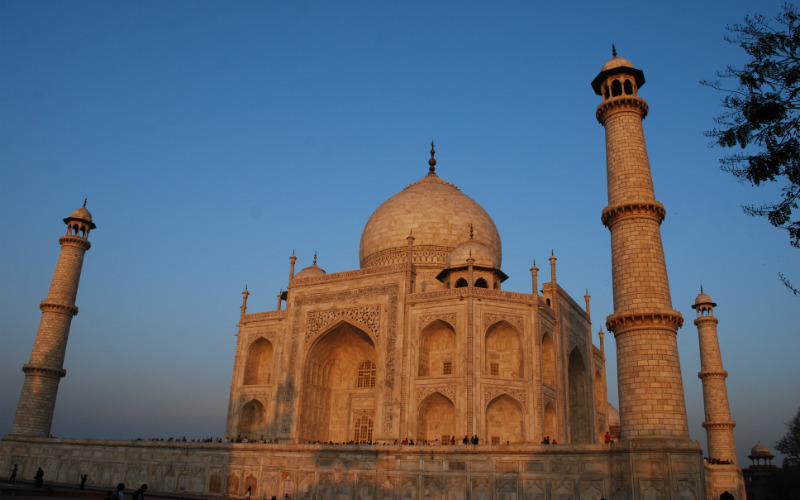 Image Credit: Ajith Kumar / CC by 2.0Taj Mahal, India. One of the oldest ghats (a flight of stairs leading to a body of water) along the banks of the Ganges River, Dashashwamedh Ghat is an important site amongst Hindu adherents. Situated in Varanasi, the holiest of the seven sacred cities in Hinduism, the ghat has two fascinating legends attached to it: that is was created to welcome Lord Shiva by Lord Brahma and that Lord Brahma sacrificed ten horses on the same spot. 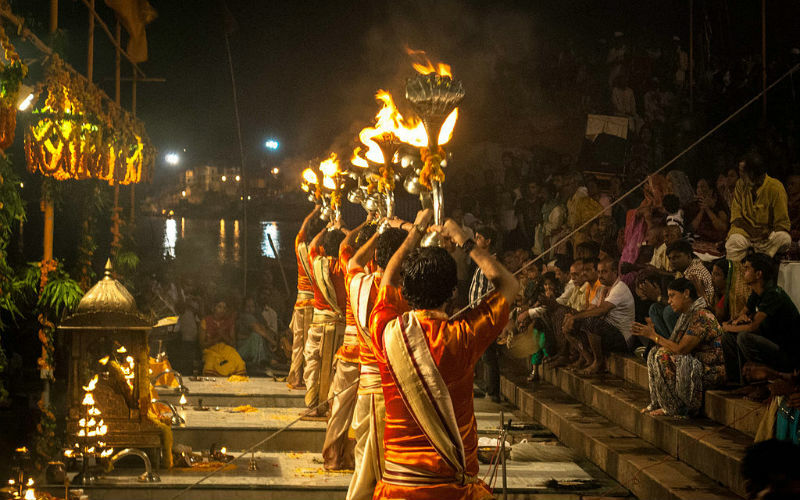 Drawing large crowds every day, the ghat plays host to the Ganga Aarti ritual every evening at sunset. A devotional ritual using fire as an offering, the Ganga Aarti is a spectacular event that shouldn’t me missed. Dashashwamedh Ghat, India. Image Credit: Sujay25 / CC by SA 4.0. 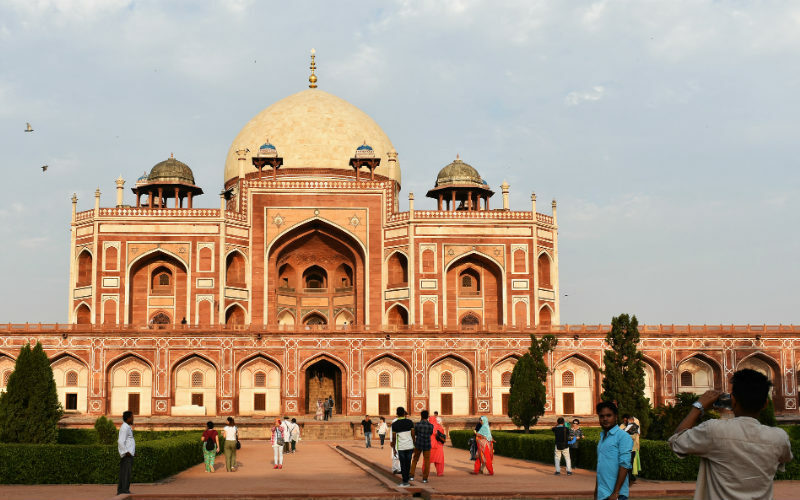 The first garden-tomb on the Indian subcontinent, Humayun’s Tomb was commissioned and constructed in the 16th century as the final resting place of Mughal Emperor Humayun. A fine example of Mughal architecture designed and constructed by skilled Persian and Indian craftsmen, the World Heritage listed site draws together architectural influences from across Persia, Turkey and India, resulting in a complex that is decorative, visually spectacular and rich with history. Located to the south of New Delhi, the symmetry and vibrancy of the towering mausoleum is truly incredible. Humayun’s Tomb, India. Image Credit: Mike_fleming / CC by SA 2.0. One of the largest of its kind in India, the 15th century Mehrangarh Fort cuts an impressive figure high above Jodhpur’s city skyline. Built from red sandstone and sitting 120 metres above the city below, it said to be one of the region’s most magnificent forts, and it’s easy to see why. 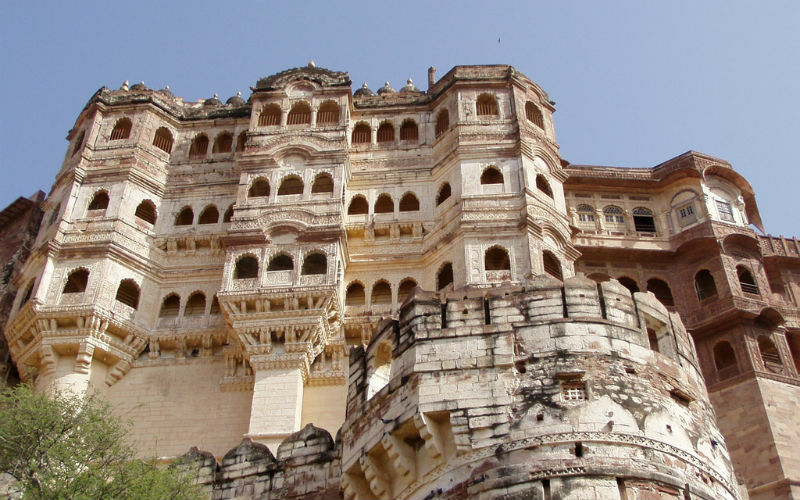 Filled with history and seeming to merge with the hill on which it stands, the spectacular grounds of Mehrangarh, including an onsite museum, are still cared for by the royal family of Jodhpur, allowing visitors to see a fascinating collection of furniture, clothing and art owned by the family. Offering magnificent views of the city below, Mehrangarh Fort is also fantastic place to soak up the sights of sprawling Jodhpur. Mehrangarh Fort, India. Image Credit: Dan / CC by SA 2.0. 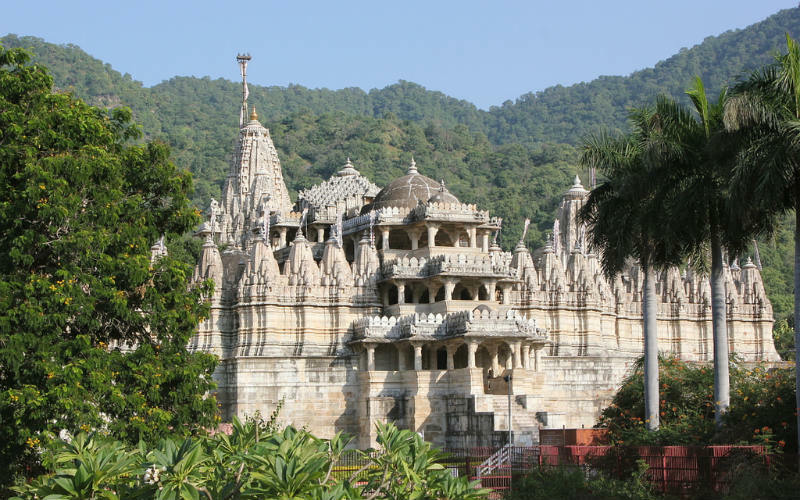 Constructed in light coloured marble following a divine vision by a Jain businessman, the 15th century Ranakpur Jain Temple is an impressive sight to behold. Incredibly ornate, both inside and outside, the three storey temple is covered with intricate marble carvings and is one of the most significant sites in India for followers of the Jain faith. Interestingly, each of the marble pillars that supports the temple’s structure is carved with a different design, with no two exactly the same. Debate surrounds exactly how many pillars there are, with legend stating that it is impossible to count them all. Ranakpur Jain Temple, India. Image Credit: Nagarjun Kandukuru / CC by 2.0. Officially known as Sri Harmandir Sahib (the abode of God), the Golden Temple is among the most revered sites of the Sikh faith. 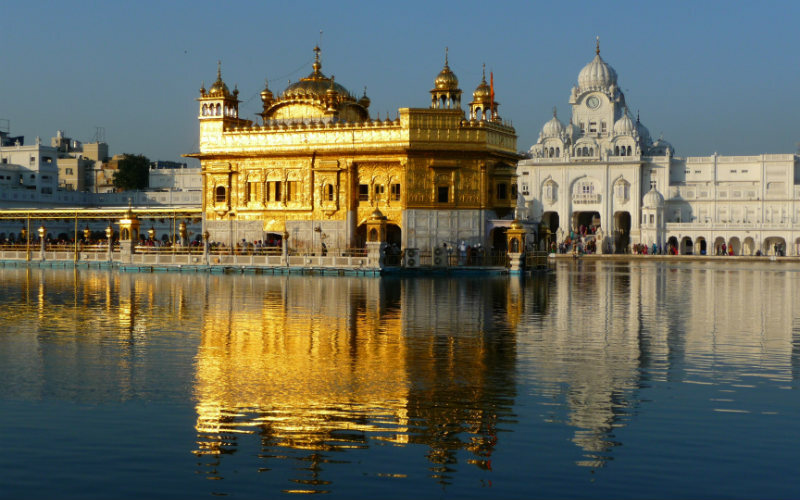 Situated in northern India in the city of Amritsar, the temple is part of a larger complex that attracts over 100,000 people each day. Encircled by sacred waters that are said to have healing properties, the gilt temple shimmers spectacularly in the sunlight, casting an incredible reflection of its Hindu and Islamic-style architecture into the surrounding pool. Golden Temple at Amritsar, India. Thinking about discovering the spectacular sights of India? 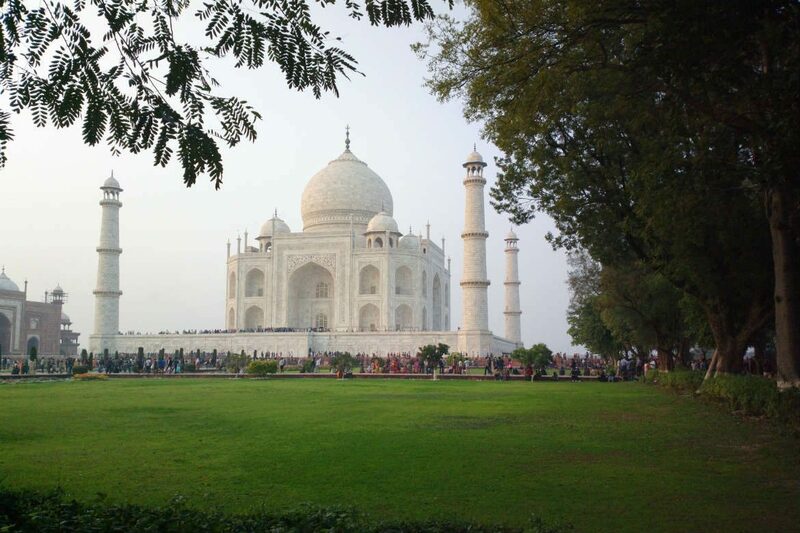 Check out the great India tours on offer from Webjet Exclusives today! Feature Image Credit: solarisgirl / CC by SA 2.0.